Kim Jaejoong’s latest photos have become a hot topic. 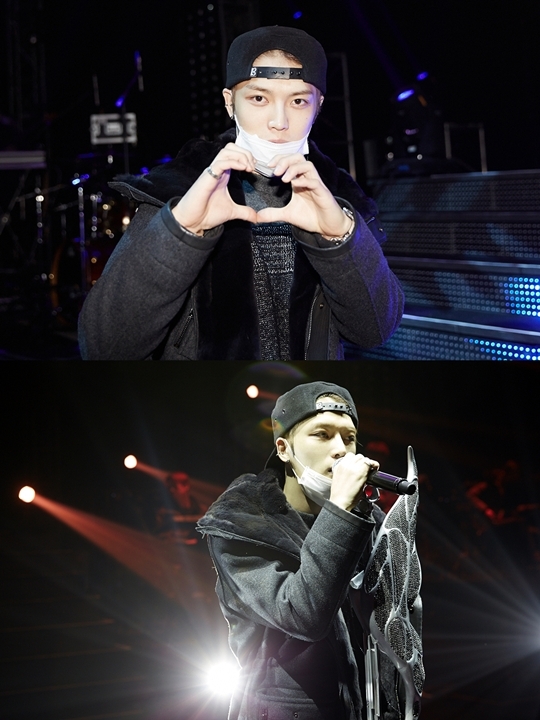 The photos show Kim Jaejoong wearing a cap backwards with a mask covering his face. His professionalism can be felt from his serious expression as he holds onto his standing microphone on stage, and he showcased his boyish charm when he made a heart with his hands towards the camera after his rehearsal was over. Meanwhile, Kim Jaejoong released his first full-length album ‘WWW: Who, When, Why’ last October and has since been on his Asia tour, traveling to Japan, Taiwan and China. Kim Jaejoong’s nationwide tour started in Busan on the 4th and will continue on to Gwangju on the 11th, and Seoul on the 25th and 26th. The Seoul concerts, titled ‘2014 Kim Jaejoong 1st album Asia Tour Concert & J Party’ coincide with the singer’s birthday, and a special fanmeet has been added to create a special experience.